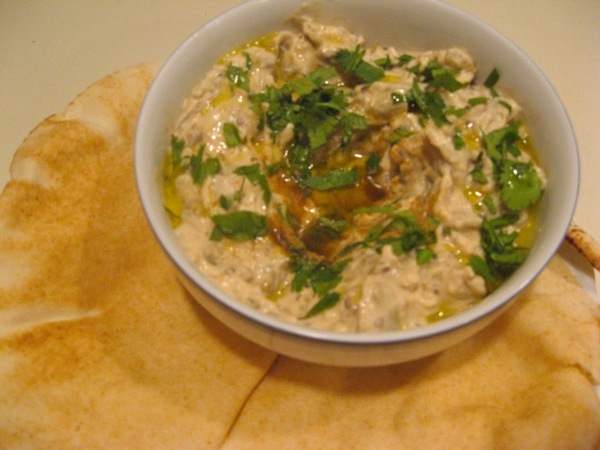 Baba Ghanoush requires no special equipment and very little cooking skill. Plus, except for the half hour you let it sit in the oven, it takes about 5 minutes to prepare. Baba Ghanoush! The great democratizer! Some recipes call for grilled eggplant. It gives a smokier flavor, but since more people have access to an oven than a charcoal grill, the cooked version appears below. Feel free to substitute grilled eggplant into this recipe if desired. Wash the eggplant and pierce the skin in several places with a fork. Rub entire surface with a light covering of olive oil. Cook eggplant in oven for 30-40 minutes, or until very soft. Remove from oven. Allow to cool, then peel off and throw out the skin. Cut the eggplant into small-medium pieces and place in a bowl. Use a fork to mash into a paste. Add tahini, minced garlic, cumin and lemon juice to the eggplant and stir together. Add salt to taste. Place in serving bowl, drizzle with olive oil, and sprinkle with cumin and cilantro.